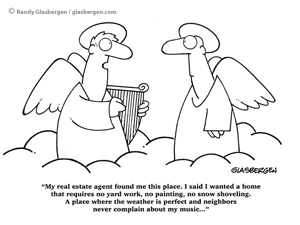 Buying or selling your home can be extremely stressful, but don’t let your anxiety get the best of you. 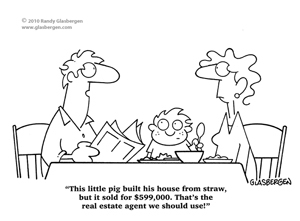 Take your shoes off, sit back, and prepare your belly muscles for some big laughs as we share with you our round up of our top 10 real estate cartoons! #10. 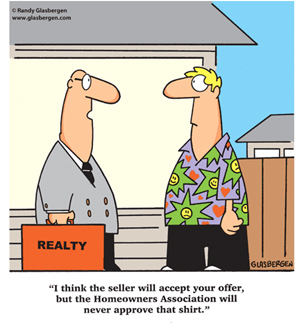 Imagine how much time we could save if all real estate agents were as upfront as this! #8. Maybe that little piggy put some hardwood in. #7. Every cloud…I mean shack has a silver lining, right? #6. On second thought, maybe renting is more your style after all! #5. A lot of first-time buyers initially want to purchase a house with a mother-in-law suite. The odds are that within a week of moving in, they’ll wish they stuck to a set-up like this. #4. Unless you’re…well, refer back to #9…you’re going to have to make some sacrifices. #3. 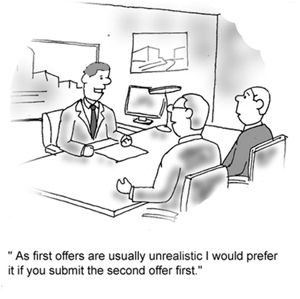 Sometimes you’ll be lucky enough to have the upper hand in negotiations, but don’t get desperate if you don’t. #2. 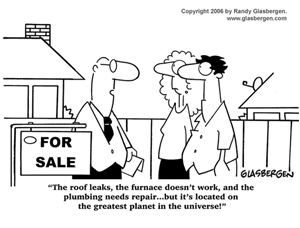 The world of real estate is a desperate place for everybody right now. 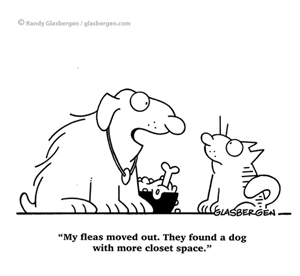 But hey, fleas need a place to keep their shoes too, right? #1. 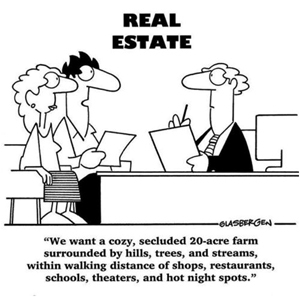 Before buying or selling your house, make sure that you’re fluent in the language of “real estate”. Wish we could enlarge the photos. I can’t read some of the writing. It’s too tiny! 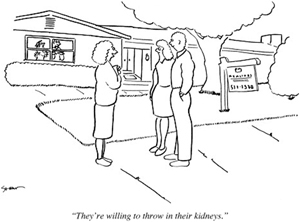 I think it’s pretty funny how many of the real estate cartoons make fun of how real estate agents upsell property by making euphemisms! Some of these are laugh out loud funny Cheers. Alright, loved the mother-in-law suite. That is exactly what I would want on my own property. On the back forty with her having to be an ex-seal team member to get to me. Also really loved the idea that everyone wants that secluded feel from the 20-acre property in the country, but have it right next to the city. Hello, it is called suburban sprawl for a reason. These were all great and so true. I was particularly amused by the ones that highlight the various — and not always so subtle — ways that properties are marketed. I especially enjoyed # 1 touting the location. The greatest planet, indeed! 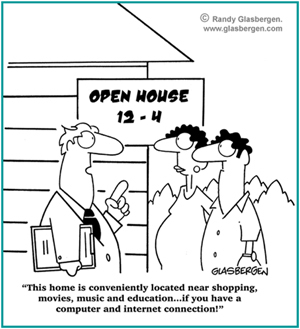 And similarly # 7 which necessitates that you have a computer and Internet access! These cartoons are great! I especially like the number four. If anyone finds a house like that, please let me know. I always long for the country, that is I long for the country until I have to go the grocery store. I don’t even know how I ended up here, but I imagined this post ended up being great. We don’t know whom you are but certainly you are going to a famous blogger in case you aren’t already All the best!